Anita travels a lot, and has had to adjust to the tighter security at airports. Recently she and her daughter were flying to visit family, and it suddenly dawned on her that these new airport scanners may not be completely safe. Funny how it took thinking of the well-being of her daughter to make her question this. Anita is absolutely correct to ask this question. 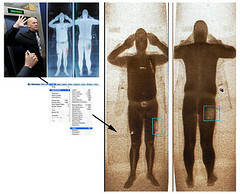 The back-scatter airport scanners use x-rays, or ionizing radiation. No amount of ionizing radiation is safe. None. You do not want to expose yourself to radiation unless it is medically necessary. Every bit of exposure you get in your lifetime is cumulative, and the more you get the more likely you will suffer consequences from this exposure. No, airport scanners are not safe. We know ionizing radiation causes damage that can lead to cancer. Preliminary research suggests that the low dose radiation from these back scatter ionizing radiation machines concentrates on the skin, and could put you at risk for skin cancer. Adequate research has not been done. If there are increases in cancer, they will most likely occur decades in the future. Will an association even be made at that point? Children and pregnant women are particularly at risk, and should never be asked to go through these scanners. Also those with gene mutations (around one in 20 of the population) are more at risk as they are less able to repair x-ray damage to their DNA. The chronically ill and immune suppressed are also at higher risk. Everyone should always refuse to be scanned. It is still within your rights, though the system is set up to discourage people from making this choice. Simply ask to only go through the metal detector or have a physical pat-down instead. If this technology becomes mandatory, then you will be forced to stop booking flights and boycott flying. The airline industry would then force TSA to find safe alternatives to this very dangerous practice. There is no other technology that will expose such an enormous number of individuals to x-rays. This is unprecedented in the radiation world. We know for fact that radiation increases the risk of cancer. Why even take a chance? Sign up in the easy form to the right and get a free report on the “Top 10 Do’s and Don’ts of Nutrition”. Nutrition is a key to having good health. Good nutrition is necessary to be able to repair your body from the damage done by the radiation that you have already been exposed to or simply cannot avoid.